Jeff was a three sport letterman at Gerard Catholic High School in Phoenix before coming to Miami, after one year at Scottsdale Community College. He became a valuable member of Miami's Football Dynasty of the late 1980's. 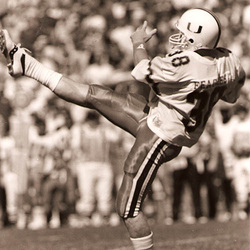 During Miami's run to the 1987 National Championship, Jeff averaged 40.8 yards per kick, but, thanks to his impressive hang time's, opponents were only able to return 12 of 34 punts that year for less than 100 yards. He still holds the school record for highest punting average in a bowl game, when he kicked for a 46 yard average against Penn State in the Fiesta Bowl. He was named to the 1980's All-Decade Fiesta Bowl First Team. After graduating in 1988 with a degree in Business Management, he was signed as a free agent by the New England Patriots and was named to the 1988 All Rookie Team. Named to the 1995 AP All Pro Team, he was a 1996 Pro Bowl selection. Now in his 20th year in the NFL, Jeff has played for 5 different teams; New England, Philadelphia, Arizona, Seattle, and is currently in his 5th year with the New York Giants. He holds NFL records for most career punting yards, total punts, punts inside the 20, and has played in an NFL record 323 Consecutive Games...including the 2008 Super Bowl and is still going. In January, Jeff was named an MDA Champion of Hope by the Muscular Dystrophy Association. Since 1990, he has held the Jeff Feagles Celebrity Golf Classic in Phoenix and has raised more than 2 million dollars for MDA. While playing for his hometown Cardinals, he was named the 1996 Arizona Cardinals NFL Man of the year. Jeff and his wife, Michelle, along with their four sons; C.J., Blake, Trevor and Zach, now reside in Ridgewood, New Jersey.